And so today I really should be giving you some menu suggestions for the week, which I skipped over yesterday, but I can’t focus on that right now (see below). Because Allison told me to make this salad tonight, and it was so good that I have to tell you. Right now. Even though it’s hours past my new 7:00 bedtime. So, remember when we were so into that curry-roasted tofu with toasted kale and coconut? I thought I made up the idea of roasting things in curry paste, but luckily the idea is also endorsed by Heidi Swanson, and she recommends the additional steps of mixing the curry paste with miso and smearing it all over winter squash. Genius. The recipe appears in Super Natural Every Day (and the original also includes potatoes and tofu and is a meal by itself; I served this as a salad with fish). The final effect here–the roasted squash mixed into raw kale with toasted pumpkin seeds, all dressed with miso and curry paste and oil and lemon–is warm and cool, spicy and bright, salty and sweet. I’d go out on a limb and say that feta cheese would be welcome addition, but we didn’t use any. Let me know if you try it that way. But whatever you do, do try it. And finally, in lieu of this week’s “What’s Cooking” post, a few quick menu ideas from our kitchen this week: Make this black bean chili (my all-time favorite) with a pan of cornbread. Roast up some roots and make cilantro pesto for this untraditional-but-delicious (and healthier, I daresay) take on nachos. Or simmer up a pot of the best saag paneer I’ve ever made (we made a vegan version this week that I’ll share soon!). 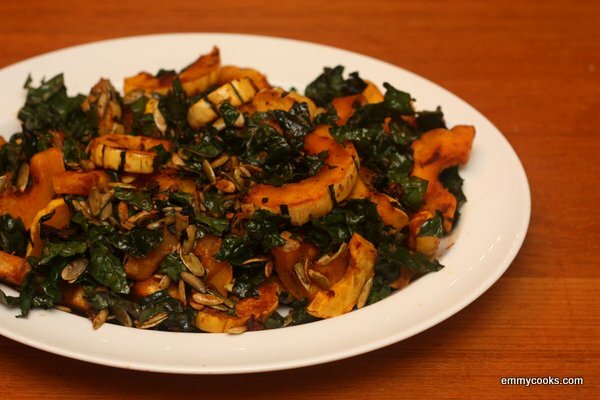 Kale Salad with Miso-Roasted Winter Squash (adapted from Super Natural Every Day): In a large bowl, whisk together 1/4 c. olive oil, 1/4 c. white miso (or less of a darker miso), and a heaping Tbsp. red Thai curry paste. Halve 2-3 delicata squash (about 2 lbs.) lengthwise, and scoop out the seeds. Slice into 1/2″ slices. (Yes, you can eat the skin.) Pile the squash onto a rimmed baking dish large enough to hold them in a single layer, and use your hands to rub about 2/3 of the miso paste all over the squash. Bake at 400 for 30-40 minutes, flipping the slices halfway through cooking, until the squash is tender. While the squash is cooking, add 2 Tbsp. lemon juice to the miso paste remaining in the bowl. Wash and chop a small bunch of lacinato or Red Russian kale into bite-sized pieces (I had about 4 c. of chopped kale). Toss the kale with the dressing in the bowl. Toast a few handfuls of pepitas in a dry pan (not nonstick!) over medium heat, stirring frequently. When the squash is ready, add it to the bowl with the kale and pepitas, tossing gently to combine without injuring the squash. Hello,hello. I just shared your post on my fruitandcake facebook page. I hope you won’t mind. Great work. Bye. This sounds like a great fall dish. So into miso right now – it’s amazing what it does for food! Great use here! What a beautiful salad! I have a kabocha squash that needs a home and this sounds perfect for it. A 7pm bedtime is truly delicious and decadent, especially with a little snuggler. This sounds WAY better than the roasted squash I made last night. Total flop – am now trying to think of a way to resurrect it (you know how cheap I am), but I am not optimistic. I shall have to try yours. Roasted squash can always be redeemed in soup, right? That’s the conclusion I was headed toward. Enough carmelized onions will probably help. Thanks for sharing this, Emmy! I’m glad you liked this recipe– and I’m glad I discovered it in Heidi Swanson’s book, and posted it after all! Nothing like falling asleep with a child in your arms. So sweet. This kale salad looks absolutely delicious. What a great combination. We have a winner in the kale salad category! The miso-curry is genius. Everyone except the greens-averse grandfather loved this last night. My problem with squash/pumpkin is that it can often be a bit bland. Have never tried it with miso though, that might work. Thanks! I’ve got everything but the miso in my kitchen. Looks like I’ll be heading to the store this weekend. Yum and yum.